Lithography, from the Greek ‘writing on stone’, was a technique of printmaking invented by chance late in the 18th century, when it was discovered that marks made by greasy crayon or greasy ink on slabs of Bavarian limestone could be inked up and printed. The advantages of this printmaking technique are that every detail of a drawing or a pen-and-ink sketch could be perfectly captured in a lithograph. The prints are cheap to make. And they can be printed in almost infinite numbers without any deterioration in quality. By the early 19th century, some of the leading artists in Europe and America had turned to lithography as an art form. ST Gill first embraced lithography in the 1840s while he was still in Adelaide, but it was on his arrival in Victoria in 1852 that lithography became for him a major art form. Gill's lithographs of Victorian goldfields were printed in their thousands and were sent around the world. And, for a time, he became the most visible of all Australian artists. 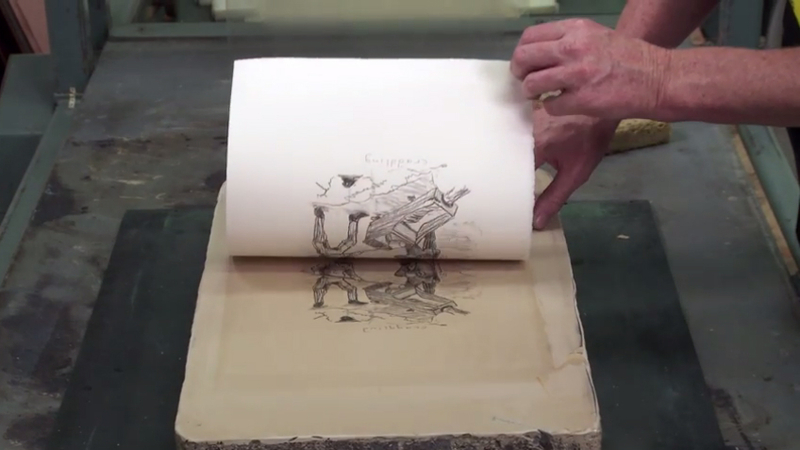 To make a lithograph, you need a press and very heavy, thick blocks of limestone from which images are printed in reverse. The artist works with the aid of a mirror to reverse the image and the text. Gill predominantly used greasy crayon with which to draw his lively images on specially prepared flat surface of the lithographic stone. When the drawing is complete, the surface of the stone is fixed with an etch, which consists of a heavy, syrupy mix of gum arabic, a sap from a tree, plus some nitric acid. This syrup fixes the drawing to the stone and prevents it from being smudged. And it also makes it impervious to water. Because grease repels water, when the surface of the lithographic stone is moistened with water and the ink is applied with a roller onto the stone, the oily ink adheres only to the greasy drawing, and not to the rest of the surface. The ink stone is then covered with a sheet of paper and is passed through the press, when even pressure is applied over the whole surface and the ink is transferred from the stone to the paper. The most exciting moment is when the paper is lifted from the stone and an image is revealed, which is as crisp and fresh as when the artist created it. This is how ST Gill made his beautiful, original lithographs.